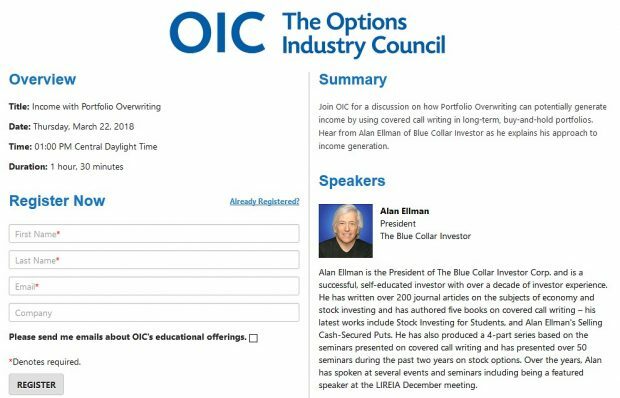 The Blue Collar Investor Learn how to invest by selling stock options. The mid-contract unwind (MCU) exit strategy is a position management maneuver we use to generate a second income stream in the same month with the same cash investment. The opportunity arises when share price moves significantly higher than the short call strike in the first half of a contract. This article will highlight a real-life example and a hypothetical set of circumstances wherein a short-term infusion of cash will be taken and immediately re-paid in order to accomplish this exit strategy. 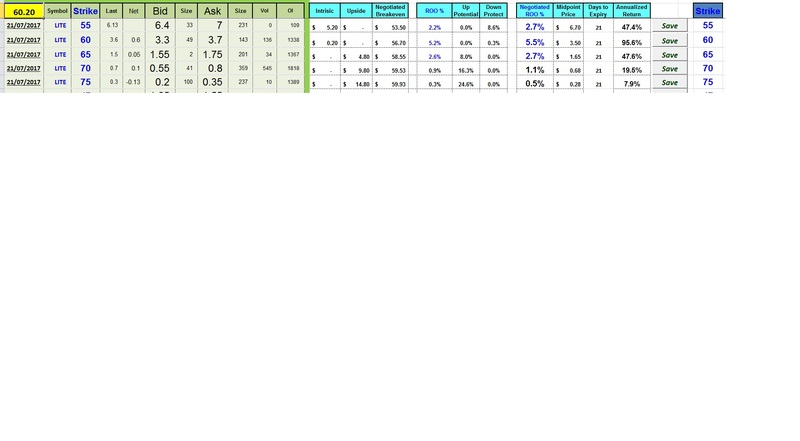 This initial trade offers a 1-month, 2.9% return with no upside potential and no downside protection of this profit. The breakeven price is $82.50. The bid-ask spread is $7.00 – $7.50. We will leverage the Show or Fill Rule and assume a buy-to-close price of $7.35. With the stock trading at $91.50, this premium represents $6.50 of intrinsic value and $0.85 of time value so the actual cost-to-close 2 contracts is $170.00 ($85.00 x 2). However, the cash required to buy back the 2 contracts is $1470.00 ($7.35 x 2) and we only have $500.00 in cash reserve remaining in this hypothetical. We find ourselves short $970.00. If we close, our shares will go up in value by $6.50 per share from its current practical value of $85.00 (our contract obligation to sell at this price). This represents a credit of $1300.00. We will need to infuse the $970.00 into our brokerage account from another resource. Sometimes we can tie our checking account to our brokerage account and accomplish this in seconds. Once the stock sale is confirmed a few days later, we can replace this “short-term loan” with the cash profit generated by the stock sale. This will still leave us $330.00 additional cash in our brokerage account we didn’t have before initiating the MCU exit strategy ($1300.00 – $970.00). There are (infrequent) scenarios when our brokerage account will need an additional infusion of capital in order to accomplish exit strategy opportunities. The MCU exit strategy is the main scenario when this may be required. Although most of the time our reserve of 2% – 4% will be adequate, we must account for the unusual situations when additional capital is required. For the week, the S&P 500 moved up by 0.21% for a year-to-date return of 8.91%. BCI: I am fully invested in the stock portion of my portfolio currently holding an equal number of in-the-money and out-of-the-money strikes. The 6-month charts point to a cautiously bullish outlook. In the past six months, the S&P 500 was up 7.5% while the VIX (10.02) moved down by 12.5%. When Should We Execute Our Option-Selling Trades? Should We Add a Short Put to Our Collar Trades? i am wondering if i could pay you to analyze a stock for me? I got in labd at 8.53 last week big mistake. I am afraid to sell thinking it will reverse once i sell. I know a little technical analysis but i am not a expert. To me it looks like its loosing strength. Let me know if you can help. I cannot give specific financial advice in this venue but I’m happy to analyze this security in the same way we analyze securities in the BCI methodology (no need to pay). See the chart below. LABD is a leveraged ETF (3x) which means it can go up a lot or down a lot. It is extremely risky but may be appropriate for some experienced investors who have a high risk-tolerance profile. 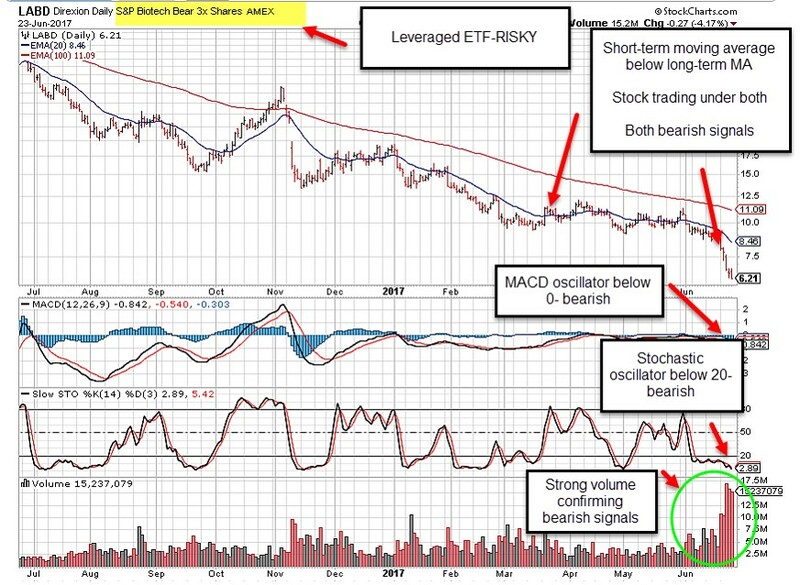 At this time, the technical indicators paint a bearish picture. I just read your post of June 21 again, and wish to comment about the multiple variations of events you mentioned. I agree 100%. It is nerve wracking and time consuming. The rest is mathematicaly linked. I have watched most all your videos and searched your blog but cannot find the answer to this. Following the unwind rules, at times i will need to sell to open mid-way between option expiration Fridays. So, for example, should I select the new expiration date a couple of weeks out or six weeks out? I use Monthly expirations (some of our members prefer Weeklys) with the same expiration dates. If I close a total (stock + option) position mid-contract, I look for a replacement security that expires in that same contract month. For example, if I closed one of my covered call positions tomorrow (Monday), the 26th of June, I would look for a replacement security which also expires on July 21, 2017. 1- Prefer the opportunity to update stock assessments on a monthly basis rather than longer-term. 2- Easier to manage larger portfolios when all positions expire on the same date. This week’s Weekly Stock Screen and Watch List has been uploaded to The Blue Collar Investor Premium Member site and is available for download in the “Reports” section. Look for the report dated 06/23/17. 2- Updated Broker Commission file for 2017…several brokers have reduced commissions recently so we updated this file. Brokers are fighting hard for our business so these stats are in a state of flux. This is a positive for our BCI retail investor community. Thank you Alan, for the Broker Commission update. I compared it to the list I created last year and of the brokers I listed, Scottrade, Schwab, and TD Ameritrade reduced their rates. I have also taken advantage of Free Trade offers when starting to trade options last year with your methodology. Funds were sitting in Mutual Funds or Money Market and CDs. I took a portion of the funds for trading Covered Calls. Optionshouse offers free trades for 60 days when you open an account of at least $5,000. I have taken advantage of this for my 2 accounts. Fidelity latest free trade offer changed recently. With $50,000 in a new account you get 300 commission free trades with a 2 year expiration period. With $100,000, you get 500 free trades. Once your free trade offer expires in an account, you can wait 12 months and then take advantage of another free trade promotion with an additional $50,000. 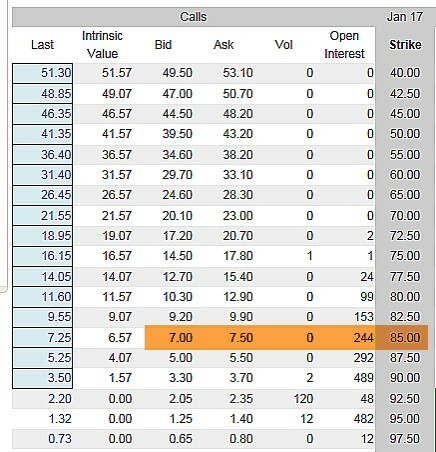 300 Trades at $6-$10 per covered call option trades is worth around $3000. So it is a good benefit. I took advantage of Fidelity’s free trade offer in April by opening a Joint Trust Agreement account under a Joint Revocable Living Trust for our Joint Funds. As I understand i, it qualifies for the free offer as long as the trustees are individual persons, and not an entity, since LLC, and Corp. do not qualify..
We had a $50,000 1.25% APY CD maturing and my wife suggested, after I have described how I did 16.5% last year with my own funds, why not use the money to trade conservatively Covered Calls (she read my mind) with ETFs and low volatile stocks. After 2 months its at $51464 or 16-17% annualized. I do have to exercise restraint as I look for securities to use each new cycle since I want to assure that is accumulates money only! You can get carried away and forget that. I prefer at this time In-The-Money contracts (not get greedy) and look at the BreakEven Point to see if there is good margin to prevent a loss. If the stock gaps up or uptrands significantly, I will do a Mid-Contract Unwind when time value is low and look for another security to make money. The Fidelity free trade offer sounds good – they don’t make up for it by charging a high monthly or annual fee though do they? No. the free trades offer at Fidelity has no strings. It is real. 24 hour service too. It used to be 6 months instead of 2 years. You can either set up the Free Trade offer before opening the account (Preferred) or Open the account and then call in to get the Free Trades offer applied. I was going to answer you separately but this is a good opportunity to answer your recent reply as to why I have 5 accounts and how much time do I spend trading 20 positions. I do not really have 20 different positions. i could not handle that. It’s 8-10 securities. I create parallel orders over 5 accounts (depending on the cash available to Trade) for the same covered call, after I study the security, see my ROO%, look at volatility, and BEP with respect to the charts. At Optionshouse, you have to set up an order, set the credit limit, and send the order before placing a similar order in another account. I then place the order and see if they fill, If not within a minute, I change the debit limit on each so I can get a fill. Working parallel, in parallel identical steps, keep my sanity and mind straight. Once you are fully invested around 90-92%, you can just monitor your positions for gap ups (mid-contract unwinds) or gap downs for Hit the Double strategies.. It is time consuming at times during the whole cycle and during Expiration Friday for the Rollouts, then the Monday and days following as you unwind or add option legs to the worthless options and look for new securities to trade. This last Expiration Friday and following Monday was great for me and I am sure others. I had worthless trades just below the strike on Friday and on Monday I added ITM option trades since they were positive or mixed. I sold off some stocks with limit orders above the breakeven point. First 2 are Fidelity Individual and IRA accounts. Used Free trades for them. Second 2 are Optionshouse Individual and IRA accounts. i wanted to diversify brokerage houses to get a different view of trading. I also qualified for Free Trades as well with them. I would have to wait for another 12 months to use the funds at Fidelity to qualify for a second free offer. The fifth account I discussed above and if for Joint Funds in a Joint Revocable Living Trust my wife and I have. Like 50% of us, we are both re-married. I don’t mind talking about this since I have spend lots of reading time from Library books reading about Estate planning and I believe and know people procrastinate about arranging for future years. I will be glad if I halp at least one person with this information. The usual thing, from what I have read, to avoid probate when you own a home is to create a Revocable Living Trust and Pour Over Will or alternatively, maybe a Will with a Trust provision. I did my own Trust for the house I own (my children as beneficiaries) and added my wife as a Life Estate in the Trust and Warranty Deed so she could live in the home till she passes. I created a Joint Trust to solve another problem. If we were both to die in an accident, there is no way for our joint funds to be distributed 50% between between my 3 children and her 1 child. You can do that with IRAs (set percentages), but with Checking accounts, CDs, and Money Market funds you can’t. That’s what the Joint Trust does. I have also learned (took some time) that banks can convert a standard Joint checking account, Money Market, to a trust account without changing the account number or check description. Among many of the free library books I read on estate planning, I found an excellent one I highly recommend and is entertaining as well: “Beyond the Grave – The Right Way and the wrong Way of leaving money to your Children ” by Jeffrey L. Condon, Esq. (updated in 2014, paperback) . Thanks Mario – Re Fidelity it sounds good, but I’ll have to find out if they let me use the money immediately after closing a position to open a new one (I’m in Australia) as that’s what I’m looking for from a broker, rather than this T + 3 rubbish that IB for instance implements. When we trade 1 contract, the commission will have a greater impact than for multiple contracts but usually it will be a minor impact. A time value return of $0.15 per share is rare. I have a question for you regarding commissions, they seem to be a hot topic this week! With the commission structure of some of the brokerages changing to no commission to close short options at 5 cents or less at Schwab (10 cents or less at Options House), please consider the following scenario. Would you close your short call option (essentially free to close) and sell the following months call option? This allows you to make additional time premium by not waiting until the week following expiration. You gain as long as the additional premium is above 5 cents (or 10 cents). You now do not have to wait for the week following expiration. This is all predicated upon you making the decision that you want to keep the underlying. 1- The time value lost (if any) is negligible because Theta has not yet kicked into full gear…very little time value erosion from (let’s say) Thursday to Monday. 2- Most market makers calculate time value erosion on the Thursday or Friday prior to the weekend after expiration…time value erosion is based on 7 calendar days but spread over 5 trading days. 3- Avoid 1 weekend of risk exposure. To make things more interesting TastyTrade – owned by Tom Sosnoff, the guy who designed TOS and sold it to TDAmeritrade, now has his own brokerage and does not charge ANYTHING to close trades. You only pay to open trades! I am sure he is making an already cut throat competitive on-line brokerage business squirm :)! Compare the premium per day that you will receive for keeping the current short call position with the premium per day that you will receive for roll out to the next week (or month). Factor in commissions. This comparison will indicate whether it is more profitable to wait a few days or roll. Another factor to consider is that if you wait for that nickel, the price of the underlying may drop and the bird in the hand disappears as next week’s (month’s) premium deteriorates. I roll/close 5 cent positions that still have several days until expiration. The reward of waiting for 5 cents isn’t worth the complications that can subsequently arise. Just contacted Schwab (live chat) and they say they (like IB) also implement ‘T + 3’ (an SEC rule they say). How are you getting around this – do you have a margin account or something? If so that would surely be an extra cost. The settlement date is T + 3 but the funds are available immediately for trading, not for withdrawal. No margin account needed. as Terry says the funds are immediately available for new trades. I do have a margin account, aproval level 2, but there are no extra charges for it at Schwab. I never use the available margin funds because it is an extra calculation item to be considered when I am trading. Also, I feel uncomfortable trading on margin, and it is against my principles. If a situation arises, such as described by Alan in the article above, I will not hesitate to use it for the MCU for a little while. The margin is there, and I do not have to worry about exceeding my funds available. Recently I called into Fidelity because I was attempting a covered call and a rules violation caution message popped up when previewing the order. Why – I had enough cash available to trade?. I was given the ok to proceed. The reason for the message was I unwound a position (Buy to Close, Sell Stock (A) Closing Buy Write) the previous day. The answer was it was OK to place a Buy-Write order (Sell option to Open, Buy Stock (B)) as long as I do not plan to sell the same stock (B) before the settlement date of the first Sell order. I will call Fidelity and Optionshouse for their rules and cost for margin accounts if not used and laid aside for those situation where you have to do a Mid Contract unwind and there is not enough cash. I use Alan’s higher end 4% rule for cash in your account and it has worked out fine for me.. I admit, though, I placed recently a Covered call order and went below that rule to complete another 100 shares in a contract with 14 days to Expiration Friday. Another Mid-Contract unwind did give me more cash a few days later. Thanks guys, great discussion on margin and settlement rules. I remember getting slapped and put in the corner for 90 days by Schwab once :). I could only trade with settled funds during that time. I think my crime was I bought something, sold it quickly, bought something else then sold it before the first trade had settled. So I was churning the same cash too quickly. Cash account trades have T+3 settlement. As you are aware, transacting with unsettled funds can lead to a Good Faith violation and a 90-Day account restriction. Trading in a margin account avoids such violations if the trader only carries a margin balance equal to or less than their cash balance. No interest or fees are charged if you do not borrow money. Thanks for both of your informative and helpful adds to this thread! I have since solved those issues by trading only in my IRA where I have Level 3 Options clearance and don’t day trade. Though I do turn over some speculative options or spreads within a day or two sometime but it is never an issue. As for option selling in your cash account, it depends on your level of option approval as well as what the broker permits. Some brokers permit limited margin in IRA and cash accounts. Others, not so much. Ironically that old man in the hat was intended to motivate, not haunt :). It’s all moot for me now since I only trade in IRA’s. That’s interesting – did you have to open a margin account there so as to make the funds immediately available after trades? if I do remember well, when I first started with Schwab 6 years ago, they required a $25,000.00 minimum to open the account. I also was requested to fill out a detailed form, informing my total financial situation, plus trading experience,(which was almost zero), plus many other details. In this same form, I checked a box requesting level 1 approval because I wanted to trade both covered calls and cash secured puts. There was a question asking me if I wanted margin, and I checked the box “no”. I did immediately get the level 1 approval. One year, or so, later, I requested level 2 upgrade, because I wanted to trade LEAPS and debit spreads. I had to fill out the same forms again. I was granted level 2 immediately, and received a substantial margin availability automatically. All this was quite easy, and straightforward. I do recommend Schwab to everyone. They are probably the best in every aspect. Cost per trade and comission is practically insignificant in this our high stakes activity. If you trade larger blocks of shares, you’d be better off at a fixed fee broker like Tradeking, Optionshouse or Schwab at $4.95 per trade. scaling in and out of positions without a flat fee penalty for multiple trades. Option commissions are 70 cts per contract (less if closing out 1 to 5 ct premiums) with free option assignment and exercise. You sometimes get rebates for providing liquidity. Some brokers also offer free trades. I think Merrill Edge offers 30 free trades per month if you meet account size requirements. Is a no-no to sell a covered call during a dividend day for a stock? Will the buyers buy the call just for that purpose? Good: We realized a $3 profit ($1 + $2) = 7.9%, 2-week return and we now have the cash from the stock sale to reinvest in the same month to establish a 2nd income stream in the same month with the same cash. Bad: Only if we want to retain that stock. This may be due to tax issues for a low-cost basis stock. The date of concern if we want to keep the stock is the ex-dividend date, not the distribution date. If early exercise occurs, it will usually be the day prior to the ex-date. See the chapters on “portfolio overwriting” in both versions of the Complete Encyclopedia…for more details. One more point. If we are looking for the “odds” of early exercise due to an ex-date, it is more likely if the time value of the premium is less than the dividend about to be distributed. That applies to the time premium of the put. There is no profitable arbitrage involving the call where its time premium is less than the dividend. Only dumb money does that which is the retail investor you cited who fails to realize that remaining time premium should be salvaged rather than wasted on exercise. It’s Discount Arbitrage that precipitates early exercise of the long call, resulting in the covered call writer being assigned and having his shares sold. We are on the same page with one caveat. For members who want more information on early exercise of options with time value components, here is a link to an article I published a few years ago. See choice #3. That said, many retail investors may not have the level of trading sophistication to fully grasp these arbitrage scenarios. This does make them “bad traders”. In the practical world of options and especially for those of us who trade large numbers of contracts over long time frames, we will come across situations where early exercise occurs even though the holder of the option had a better choice. Mistakes are a part of life and none of us can know everything, me included. It never hurts to add another piece of information to our arsenal and become an even better trader. It is up to the individual call writer to decide how much of this “fact-of-life” we want to factor into our trading decisions. As I said in my previous post, early exercise in these situations is quite rare. However, if there is a possibility of serious tax consequences, we must at least give this some thought. Your link provides a good explanation of the three scenarios for the holder of a call that is trading near parity. I didn’t mention the carry cost because I did not want reader’s eyes to glaze over any more than necessary (g). But since you mentioned it, higher interest rates inflate the value of the call and higher dividends inflate the value of the puts, respective to each other. The only thing that I see differently is that call owners will tend to sell their positions in advance of the ex-date in order to salvage any time premium and avoid the intrinsic value reduction when the stock goes ex-div. That can drive the call’s bid below parity and that presents the opportunity for the Discount Arbitrage. Since I briefly mentioned it, I might as well explain why the ITM short put is subject to early assignment (Dividend Arbitrage) if it’s time premium is less than the dividend, obviously, ignoring carry cost (g). There’s no arb that can be constructed if the time premium of the ITM call is less than the dividend because being short the stock means paying out the dividend. If an in-the-money option option trades below parity (Discount Arbitrage), it presents an opportunity to lock a risk free gain because the call buyer can exercise the call while shorting the stock, thereby locking in the discount to parity. The same holds true for a discounted put except that the put buyer buys the stock and exercises the put. You sold a covered call. If there is time premium remaining, there is no incentive for the call owner to exercise the call early to acquire your stock because by doing so, he is throwing away time premium. It makes more sense for him to sell the call for salvage value and buy the stock outright. Where the dividend comes into play is if the time premium of an in-the-money put (NOT the call) is less than the amount of the dividend. The arb is to buy the put and buy the stock and on the ex-dividend date, exercise the put, and receive the dividend on the Pay Date. This has nothing to do with you since you have a covered call position. Just a query re the Ellman calculator – I don’t recall if I altered the formula previously, but shouldn’t the final part of the formula be dividing by the B cell rather than the D cell? For instance a stock price of 62.95, option price of 9.20 and Strike of $55 gives me a ROO of 2.3% in the calculator, but 2% if I change it to divide by B. Also I notice the DCCC gives a figure of 2%. The Ellman Calculator is designed to assist us in entering initial positions or evaluating position management choices. The DCCC is designed to evaluate current status of trades if closed at that point in time. Since the $55 strike is $7.95 in-the-money, the $9.20 premium consists of $1.25 in time value where the $7.95 of intrinsic value is NOT considered profit. In the Ellman Calculator, we use the intrinsic value to reduce cost basis ($62.95 – $7.95) to $55 or cell D.
That was rather confusing as I’d thought they were both supposed to give the same result, basically “How much can I make from this trade?” Just based on what you’ve written above though, if you wanted to calculate your profit % after the trade had completed and you’d made the maximum $125, then it would be $125/$6295 = 2%? Yes, see the screenshot below I created from Code D2 taken from the Schedule D of the Elite version of the Ellman Calculator. This is from a tax perspective. From a practical perspective (also my perspective), the intrinsic value lowered our cost basis to $55 making our return 2.3% but that’s not how our government sees it if trading in a non-sheltered account. Let me add my viewpoint as to why the equation uses $125/$5500 or equivalently by dividing by 100, per share 1.25 / 55. $55 is the strike and what I also call the ROO Cost Basis for the In-The-Money Position. I thrashed this around in my head for a long time but understand better now why the Cost Basis is the one to use. Stock price: 62.95 Strike 55, Premium 9.20, Intrinsic 7.95, TV 1.25. As I explain below, I view the intrinsic value as an immediate Gift of Cash that you can use immediately for other investments. For simplicity’s sake, assume you Bought the stock, sold the option. Your cash goes down by the stock value but added back to your cash is the Intrinsic plus the Time value. So the Investment amount in your cash is Stock price – Intrinsic or $62.95 – 7.95 = $55. You stake in the position is $55. Your risk in the trade is $55.00, since you got $7.95 back. The time value is your gain or profit. You can use the $7.95 elsewhere (to earn interest or another position) and you make the ROO% as long as the Stock price stays above the strike. If the then assume the spread was 0, and minute later, bought back the option back at the same premium (no spread) and sold the stock at the same price. Your cash in your account would be even. No change in your cash. No money lost. Everything balances. Next assume again you bought the stock, sold the option but this time you were exercised (assigned) 1 minute later. Again you cash received the Intrinsic plus Time Value for a stake or cost basis of $55.00. That is the risk you have invested, your were given the intrinsic or $7.95 back into your cash account. You can use the intrinsic value to invest elsewhere again. When exercised one minute later, you get back $55. Since your cash already has the Intrinsic value for your free use, you ended up with your Cash position now the same as you started but this time the Time value of $1.25 is added to your account. your gain or profit is $1.25 / $55 = 2.3%. You cannot use the original stock price as your cost anymore. This is how I started viewing the Intrinsic value after much soul searching. Maybe others have a different viewpoint. Here’s my take. When you place a Buy/Write combo order, the asked price is the ask price of the stock less the bid price of the call that you are selling. It doesn’t matter whether the call is ITM, ATM or OTM. The cost of the position is the stock’s price less the premium received and this is the amount of money that you have at risk and therefore, it is your cost basis. If so inclined, the numbers can be annualized. I agree 100% with spindr0. You are debited 53.75. So if you are exercised at 55.00, you will make 1.25, which is 2.3% max. return. When i consider entering this trade, I name it 2.3% ROO, which is a red flag when you consider the huge 14.61% downside protection. It means that the market maker expects the stock to gap down big time. Far above my risk tollerance. If there is pending or actual news that dramatically affects the stock then auction reflects the altered risk/reward perception and implied volatility increases as do option prices since there’s now a higher expectation of price move in either direction. The market maker’s perception of risk is often reflected in a sharp widening of bid/ask spreads to make it more worth his while for taking on that risk. Bear in mind that market makers hedge away much of the risk through conversions and reversals, etc. where the two counter parties carry all the risk. The MM is just scalping in the middle. If you want further details, Google these terms or just ask. In Justin’s example, with the stock at $62.95, by selling the $55 strike, you are agreeing to sell the stock for $7.95 less than current price and therefore the call premium must reflect this amount plus some time premium ($1.25). You could sell the $50 call or the $45 call and get even greater amounts of downside protection. This larger and larger intrinsic value component of the downside protection is merely a reflection of pre-selling at a lower price not an expectation of the stock gapping down big time. It’s you prerogative to think that a 2.33% ROI suggests high risk, but unless I missed it, Justin did not mention an expiration month. Therefore, I wouldn’t judge that yield since it could be for 2 months (higher risk) or 8 months (lower risk). this is very instructive, I love your explanation. Also, I did not percieve the lack of expiration month, and presumed it was a 1 month example. So obviousely you are right. Sorry, my mistake. As I trade exclusively one month options, I never find a 2% premium for ITM 14% protection. You’re welcome. It’s wasn’t a mistake on your part since the expiration as well as the dividend (if any) were lacking from the B/W info presented. Given that you utilize one month options and you don’t find any with a 2+ pct time premium yield with 14% of ITM protection, you intuitively recognized that this would be a much more a risky underlying for this set up to be for a one month covered call write. And since dividends deflate call premium, if there was a large dividend involved, even more risky. Other than incorrectly factoring the intrinsic value into risk assessment, your take on this was dead on. Wow, obviously this is a topic people have given a lot of thought to previously! 🙂 Thanks for the detailed responses guys, I now see that for my purposes I should be dividing by the strike price, due to Mario’s point that the intrinsic goes back into my account (I wasn’t clear on that before.) Re Alan’s point about the 2% figure for tax purposes, I’ll have to check with my accountant about whether that would apply here in Australia. The topic is red hot because this is so subtle. I will place LITE on my five star list for trading, despite the negative PE ratio. Today LITE is down almost 6% as I write, but I do like it very much. Your ITM trades are still very valid. You may get a chance to buy the calls bac at 20%, and hit a double when the scare is over. Yes even though LITE has dropped nearly 10% since I placed the trades I’d still show a decent profit if the option were to expire at the current share price. Hopefully though there’ll be a ‘buy the dip’ rally soon to send everything spiralling northwards again. Btw if you like LITE you can get the 55’s for about a 4% ROO with 4% downside protection going by the latest chain. I do like LITE, but I am fully invested at the moment, and must wait for some cash to be freed up by MCU, or by Friday 07/21 expiry. If a stock is selling for 10$ and I write a CCall for 9$ can the buyer exercise the call if the price ends below that amount i.e. 8.75$? This has been a busy blog and Alan has had a lot of things to review. Alan, can you recall this many comments on a blog by Tuesday night :)? I sure can’t! Thanks for your excellent response to Dan in explaining how American Style options work. The BCI team is pleased to provide this forum and inspired by the outstanding comments and questions posted by our members. This gives us the opportunity to learn from each other as we strive for our goal to become financially independent and CEOs of our own money. To those new to this blog and to option-selling, feel free to post questions even if they seem basic. There are no questions too simple for this venue…we all started in the same place! This thread is a record breaker. I hope it keeps on growing. Today is the down day you predicted last week. I hope you will get many bargains. I give seasonality some credibility. June is usually the worst month of the year for Tech, July into early August often holds the summer rally. Then from there through September the market can be a moody old dog :). The 4th quarter is usually pretty good to finish out the year. Every year stands on it’s own but this one seems to be following the script. I covered a lot of things in June and glad I did. I have not covered anything for July since premium is low and I think upside has a chance. Since for call over writing I only use index ETF’s, SPDR Sector ETFS and Blue Chips which all have weeklies/high liquidity I calendarize by literal months. My open covered calls all expire tomorrow. I will let my holdings run free for July…. Yeah! XME went up about a $1.00 today. It’s generally contrarian to the market. Holding on to it as a Stock till I least reach the BEP. Probably should have gotten rid of it earlier as Alan suggests as Dead Profits to invest again. Was a covered call one time back in time. I could try to start a rolling down strategy and write OTM calls against it to lower my BEP, as suggested in Alan’s Classic Encyc. Page 257-259. In general, that’s one of the reason I tend to not like CSPuts – since you don’t have an opportunity as a stock declines, to close the option at the 20% / 10% rule and try to hit a double within the cycle if the stock recovers to near my purchase price. I will use a put if the if I cannot find a CC premium that is acceptable but the Put premium is.. Found that to be true several times. Perhaps we look at the Cash secured puts differently. I like to sell them on down days on things I want to own at a lower price. If they go up that is fine, I buy back the put closing an income trade and roll it up staying under the price of the security. Sold 5 Aug 136 cash secured puts on QQQ for 2.80 on a recent dip. Received $1400. I have a high cash balance at the moment. The put has lost some value. If QQQ keeps going up I can buy back, lock in a profit and sell again. The debate can rage whether I would have been better off buying the QQQ and writing an OTM call. Both will work if it goes up. Covered calls and short puts with the same terms are synthetically equvalent which means that when you factor in dividends and carry costs, the P&L of each will be similar. The advantage of the short put is the potential for fewer commissions and less frictional costs. While I have no clue what the 20% / 10% rule is, any adjustment that the covered call writer makes can be applied to the short put writer as well and the future performance of the respective positions will still be the same. This blog is winding down and a new one will start in the morning. It is great having you here because you know your stuff! The 20/10 guideline is about buying back covered calls on stocks that go down during the month. Thanks for the kind words Jay. I’m just a retail guy who has been doing this for a long time. Having survived that long time (g), I’m now more risk averse and for option income I lean more toward verticals and collars. Though the premium is lower, the ROI and margin are much, much better and IMO, they offer better risk management possibilities. Buying high delta calls (Stock Replacement Strategy) is a good way to buy on the cheap and limit the potential loss if the stock collapses. These can also be used as a stock substitute for long stock in a covered call (a diagonal spread) and is often called the Poor Man’s Covered Call. Lots of ways to skin the cat. Subscribe Here - Have the latest blog articles sent to your inbox. Join our membership subscription today and gain instant access to expert resources including the popular Weekly Stock Screen & Watch List.